The 2017 retail sales outlook remains positive, due to robust private consumption driven by an improved housing market, job growth and higher wages. 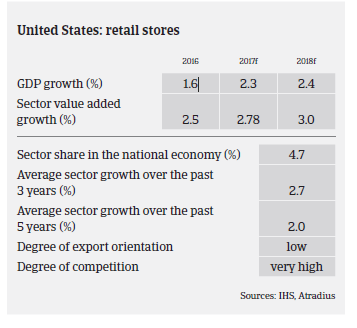 The retail sector is a major contributor to the US economy, accounting for about two-thirds of GDP (contributing USD 2.6 trillion annually to US GDP) and employing nearly 16 million people. The Christmas holiday shopping season accounts for almost 20% of the entire US retail industry’s annual sales. 2016 holiday sales increased 3.4% in 2016, with online sales rising 14% (the fastest growth in five years), while department store sales decreased 7%. In 2016 annual retail sales increased 3.3%, with online retailers recording a substantial increase of 11.4%, taking more market share away from traditional department stores, whose sales declined 5.6%. The 2017 outlook for US consumer durables sales remains positive, due to robust private consumption driven by an improved housing market, job growth and higher wages. If the US Congress passes tax cuts early enough this year, this could have an additional impact on spending in 2017. At the same time, faster than expected interest rate hikes could hamper consumer spending, and any trade restrictions imposed by the new US administration could increase prices for imported consumer durables goods, thereby reducing consumer spending power. The US furniture market has been growing since 2009, and furniture sales are expected to continue to increase in 2017 as home sales are rising and consumers have switched expenditures back to furniture. While online sales are rising fast in this segment, many consumers still prefer to research online but purchase in-store. Innovative products that connect furniture with smartphones or combine furniture with technology and fashion design are thriving. Consumer appliances in the US continued to record positive volume growth in 2016 and are expected to grow modestly in 2017, with major appliances continuing to outperform small appliances. That said, US consumer durables retailers will continue to face a very competitive environment with further pressure on margins in 2017 due to changing customer preferences, including the continued rise in online sales. E-retailing is expected to remain the fastest growing sales channel and to shift the retail landscape, increasing its share of total sales to 20% within the next seven years. Especially in the electronics and toys segments competitive dynamics are fierce between online and brick-and-mortar retailers. Global specialty retailers could face headwinds from the continued appreciation of the USD against the British pound and the euro. The stronger currency could also impact the flagship stores in tourism centres such as New York, by curbing sales to international visitors. Retailers facing a shift in customer shopping habits and attitudes toward discretionary expenditures have responded by moving to omni-channel models in order to holistically serve customers across their online and brick-and-mortar presence. Although shoppers will never completely abandon brick-and-mortar stores, they expect retailers to offer a convenient online alternative. In 2016, a significant number of retail store closings and bankruptcies were an indication of both shifting consumer preferences and growing online competition. The number of bankruptcy filings by US retailers with at least USD 250 million in liabilities nearly doubled last year, and the excess of available retail space in the US and stronger competition could lead to some major retail filings and department store closures in 2017. Payments take 90 days on average, and payment delays are expected to increase in 2017. 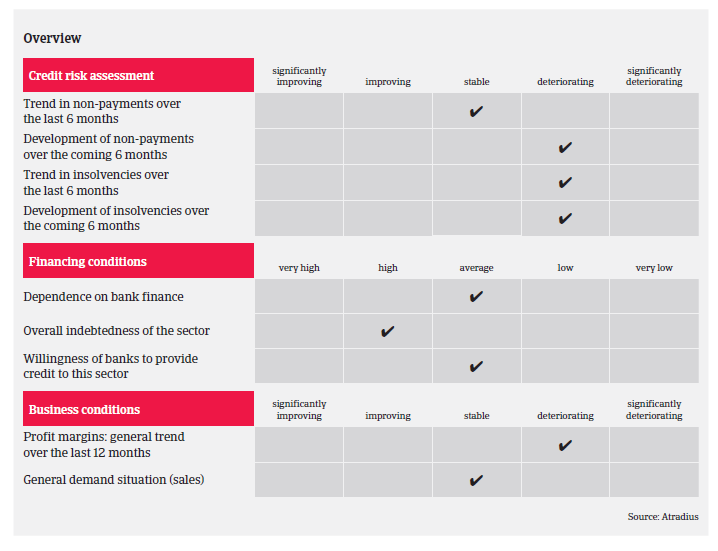 Our outlook for the overall consumer durables sector remains mildly conservative, as, despite the general sales upswing, the industry continues to be characterised by increased competition and continued price and margin pressure. Therefore, businesses within the industry should be carefully evaluated and liquidity should be closely observed. 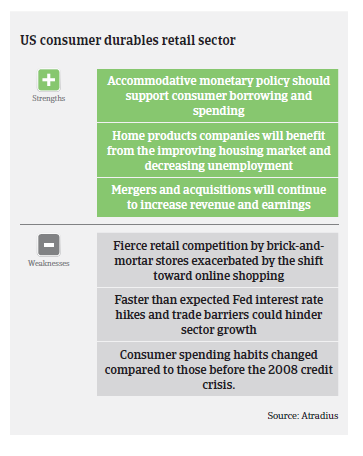 Specific subsectors are viewed more positively than others: while solid home sales should support demand for furniture and other home goods, we are more cautious on segments like electronics and toys. The current trend of merger and acquisition towards a subsequent consolidation in the US food market is expected to accelerate in the coming years.